20 years ago, drinking tea on a russian train. today should have been dad's 81st birthday. i think some part of me still can't believe he's gone. i thought several times, i have to call and wish him happy birthday. i mentally calculated the time and then i realized he wouldn't be there on the other end. it's so strange that he's gone. he's just been there for 47 years. and although i was rubbish at calling or emailing often enough, i just knew he was there if i needed to ask him something or tell him a story. it's still so strange that he's not there anymore. i wonder if i'll ever get used to it? i almost made a german chocolate cake (his favorite) in his honor today, but in the end, i didn't, because it feels too raw and i think it would have hurt more than it helped. and on this rainy, dreary, dark grey day, i didn't need more darkness. 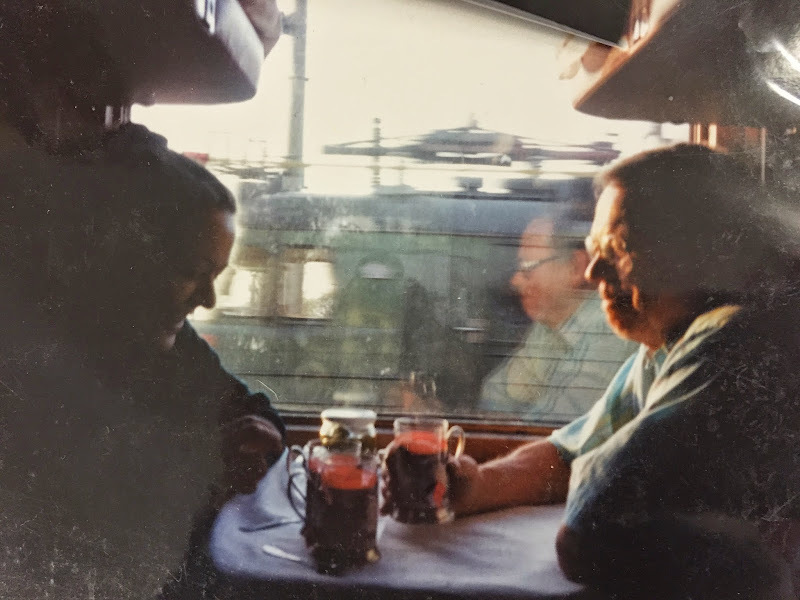 so i'm trying to think of the good times, like here, drinking tea on the train from moscow to kazan when dad came to visit me in russia in 1994. that was an awesome trip. we laughed and had adventures and tho' there was bickering at the end of the day because everyone's feet were tired from traipsing all over moscow, it was really pretty much only awesome. i'm glad to have the comfort of that and many other memories. but i miss you today, dad. happy should-have-been birthday. this photo makes me smile - it looks like such a good time. wishing you all the things people wish when there are no words to fix things. Great photo. Anniversary dates always haunt. Like a brush-burn on the knee they are a stinging reminder of the past and the emptiness of the future. My Father passed 5 days before his Birthday. It is still hard, that was 18 years ago. Sending comfort your way. Beautiful memories and an awesome picture to reflect upon! Hugs and healing my friend!